A collection of ideas I have run across. Ever have trouble with your Mini over heating ? Have to run it with the hood open ? Spend down time waiting for it to cool off ? materials contribute to this problem. Block off the holes around the radiator. 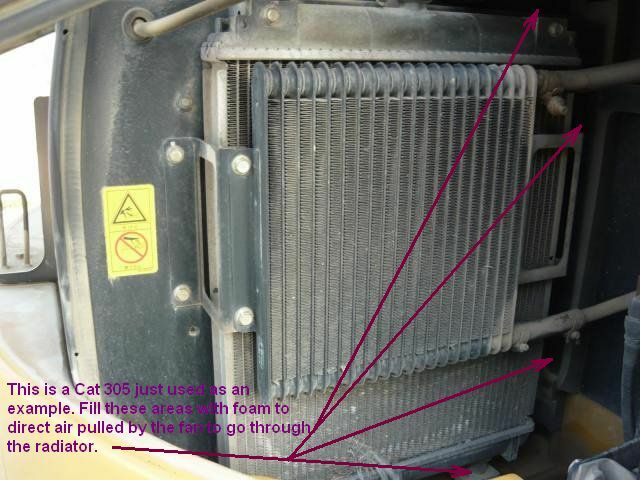 Replace all of the foam around the radiator. Plug the areas all around the radiator with new foam. Sides, top & bottom. This will redirect all the air to go through the radiator. Problem solved ! Got this idea from Dan Walker at a job site. DB Walker Trucking & Excavating Inc.
We built this plow from a old Sub-Soiler made for an 8N Tractor. Overall length of the Sub-Soiler is 40". (top to bottom) The chute was just mounted on the rear side of it. The chute was made 1 ½" wide on the inside. The point where the 3 point hooks up is 23" from the toe of the Sub-Soiler. This makes it capable of plowing cable or poly tube about 20" deep. We tried it out for the first time 6/1/2007 and found it to work excellent. We plowed in 160’ of #10 (2 conductor with ground) direct bury underground wire in about 10 minutes. We pulled it with a Kubota 32 hp tractor. It pulled the plow easily. After kicking the rocks back into the plow path, we wheel rolled the plow path and back bladed it finishing the full job in under a half hour. 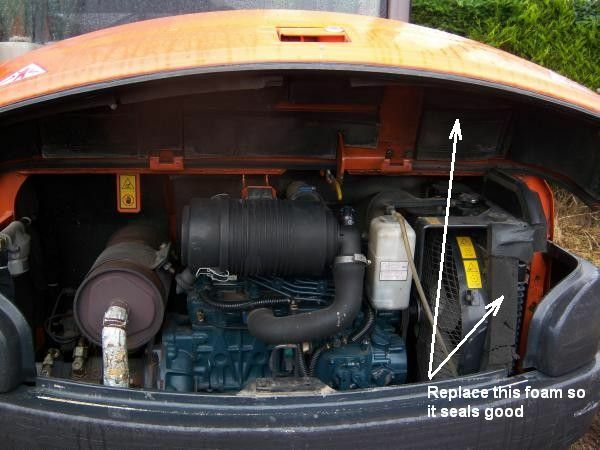 The one drawback of Kubota tractors is the 3 point draw bars are short and they will not drop down to ground level. With our Sub-Soiler/Plow you need to be able to drop near ground level to plow full depth. We dug up our wire after plowing it and found it to be 12" deep. Plenty for our first time application, but not for all future jobs. After checking other brand tractors we find most of them drop the 3 point bars near ground level. We were so enthralled with how well it worked this first time, we forgot to take pictures. We will take pictures of the plow mounted on a tractor next time.